Another day, another disaster movie though this time, don't expect The Rock to be showing up to save the day. 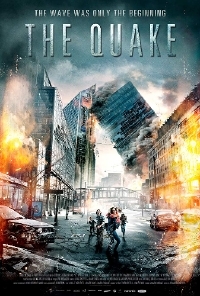 John Andreas Andersen's latest is The Quake, a disaster movie which imagines the destruction of Oslo if a big enough earthquake were to strike. The movie co-stars Kristoffer Joner who also starred in another disaster movie from Norway, the disappointing The Wave which suggested destruction to come but didn't deliver until the very end. At least in the case of The Quake, it looks like the destruction will come early and there will be much of it. Andersen has a background as a cinematographer, including Headhunters, Babycall and King of Devil's Island, which certainly bodes well for his latest which looks impressive. I love a good disaster movie and The Quake definitely looks promising. I'm not expecting much in the way of drama but I'm in for destruction and it looks like the production hasn't skimped on the effects here. The Quake will be available in theatres and on VOD December 14. Really?! All of a sudden this is every higher on my watch list!